Watercolors are so beautiful and breezy most of the time. It's typically light and airy but at the same time grounded with deep colors that span the spectrum. I have become much more interested in watercolors lately, especially out of their traditional paint and paper context. 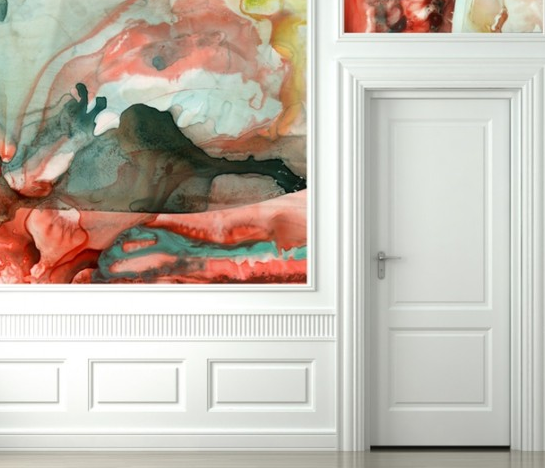 Watercolors don't have to be limited to a small framed space on a wall. Why not do an entire wall altogether? Or embrace the colors and wear something flowing and watercolor-inspired? Branch out of that frame that your watercolor painting is in and let the paint flow elsewhere! This is by far my favorite example of embracing watercolor. If I had a dining room, I would do this to the walls in a heartbeat. As an invitation designer, I love the simplicity of this design paired with the intensity of the watercolor effect. If you're short on wrapping paper, get creative! This is entirely to pretty to open! Such a beautiful way to display color while being elegant and fun at the same time. Choosing almost-monochromatic hues are the best way to go when it comes to watercolors. Can I Be A Little Girl Again? We're Going To Eat A Shark. Fun Things For The Weekend!